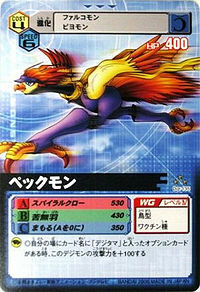 A Bird Digimon with powerful leg strength, such that it would be faster for it to run than to fly in the air. 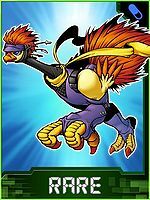 Its Special Moves are jumping high into the air, rapidly spinning its entire body and pulverizing the enemy with its gigantic claws (Spiral Claw), and firing the steel feathers it stores in the undersides of its wings (Kunaibane). Also, it specializes in a striking technique in which it pecks the enemy with its sharp beak like a woodpecker (Thousand Beak). 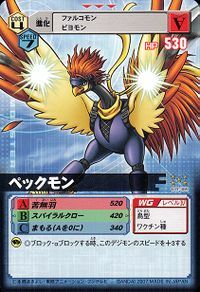 An Adult Bird Digimon with powerful leg strength. Its Special Move is "Spiral Claw". It raipdly spins its entire body and pulverizes the enemy with its gigantic claws. Anime/Manga Digimon Next: "Black-Winged Knight!" Leaps into air and spins at high speed drilling into foe with its talons. Pecks the enemy moving fast enough to create an army of after-images. A spinning Spiral Claw that will burn from the friction. Uses the powerful legs to attack with a front kick. Attacks with an even stronger front kick. Kunaibane  Kunai Feathers 苦無羽 N/A Kunai Wing Throws blades of feathers at foe. 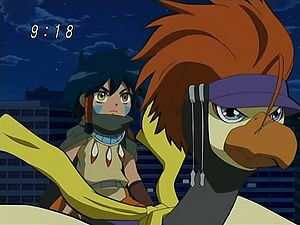 First appeared in Digimon Savers - Episode 14. Peckmon is the partner of Noguchi Ikuto. First appeared in Battle 02. 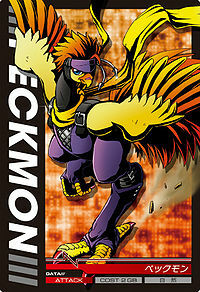 Peckmon is the partner of the Black Knight. 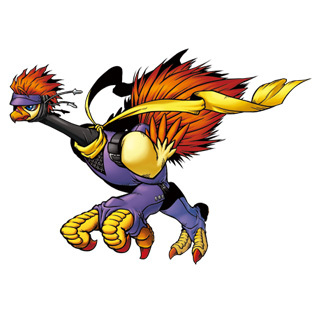 He is an Illegal digimon, and has the ability to move faster than the network can render his movements. Can be evolved from Falcomon if above level 20 and Friendship above 70%. He can evolve to Yatagaramon if above level 36. Can be evolved from Falcomon if above level 20 and speed 100. 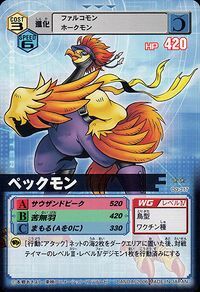 Can evolve to Yatagaramon if above level 37, friendship 80%, and Bird EXP 3500. 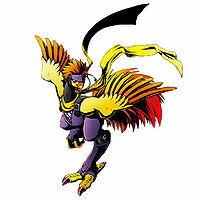 Evolves from Agumon, Candmon, Falcomon, Gaomon, Kamemon, or Kudamon. 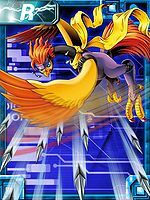 Can evolve to Mach Gaogamon, Mammon, Mega Seadramon, Rize Greymon, Shawujinmon, Tyilinmon, or Yatagaramon. 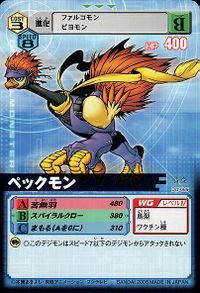 Can also Burst Evolve into Tonosama Gekomon or Yatagaramon, or Full Burst Evolve into Ravmon. A Bird Digimon that, while capable of flying, moves much faster by running thanks to its developed, powerful legs. Using its leg power, it can jump high into the air and do a powerful spin, thrusting itself into the enemy like a shuriken. This page was last modified on 15 April 2019, at 22:46.